I am happy to change the ear wires to silver if you wish - let me know at checkout. 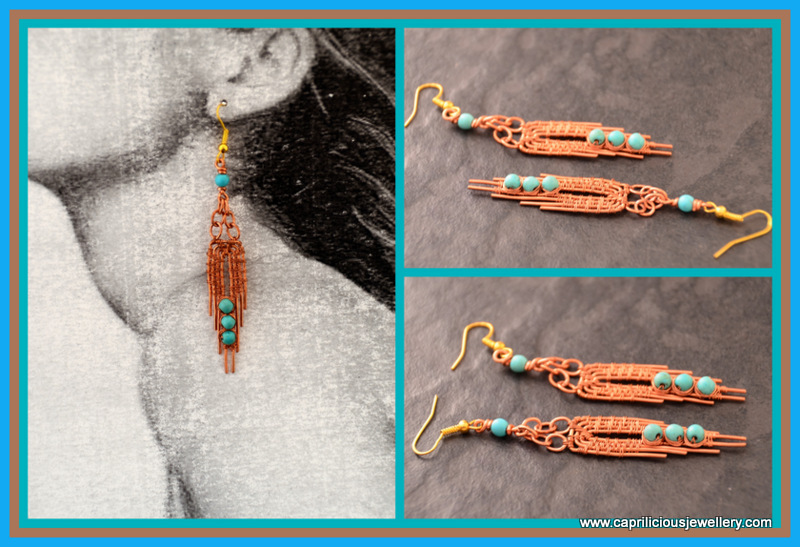 Copper wire earrings, with turquoise accents, dangling from copper chains - very unusual. 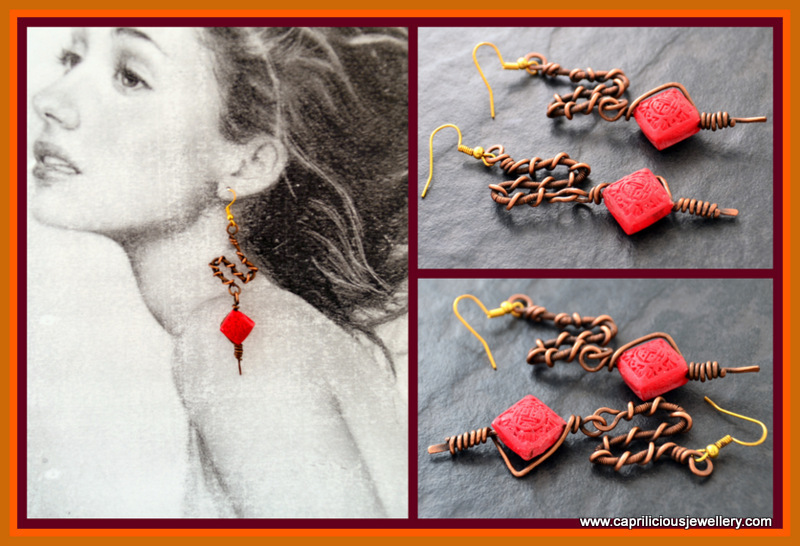 Hand made wire work earrings, 2.8" long, 0.75" wide. These earrings are made using elements made in my kiln. 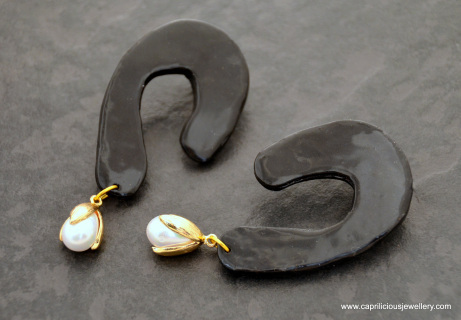 The bronze clay is shaped, finished and fired, shined, polished and sealed with a micro crystalline wax and is then ready to be made into jewellery. 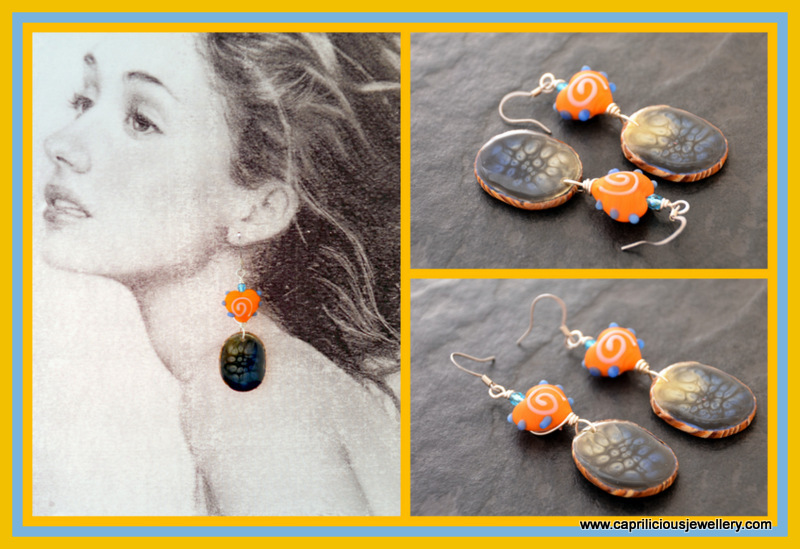 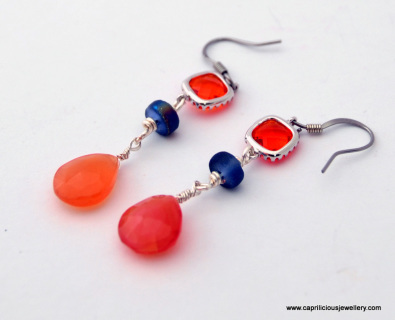 I attach real gemstones and freshwater pearls here, to make pretty earrings that sway delightfully. 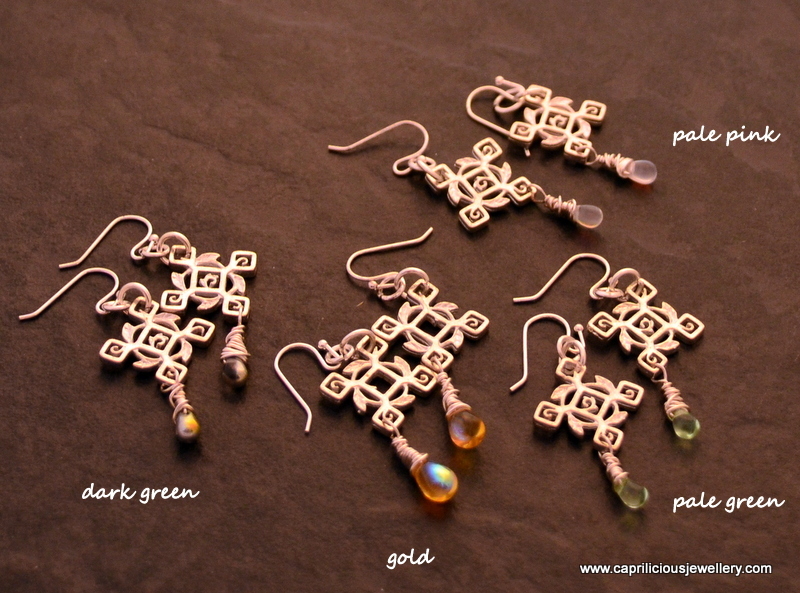 I am happy to change the ear wires to silver if you wish - let me know at checkout. All measurements have been taken from the top of the ear wires to the tip of the danglers. Little ornate bronze dragonflies, with pale blue Czech flowers and freshwater pearls 3" long earrings. 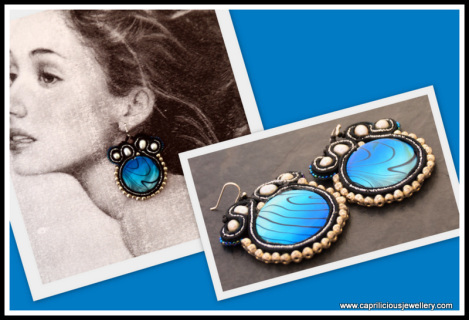 So pretty, so light and so Caprilicious! 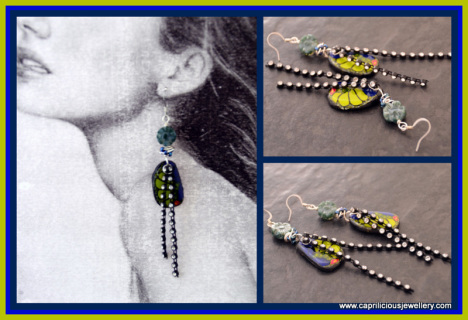 Tiny neon Czech glass teardrops dangle from these pewter earrings - they will take you on a cruise, a winter sun holiday or even just remind you the way it was last summer - and the way it will be again! 3" long. 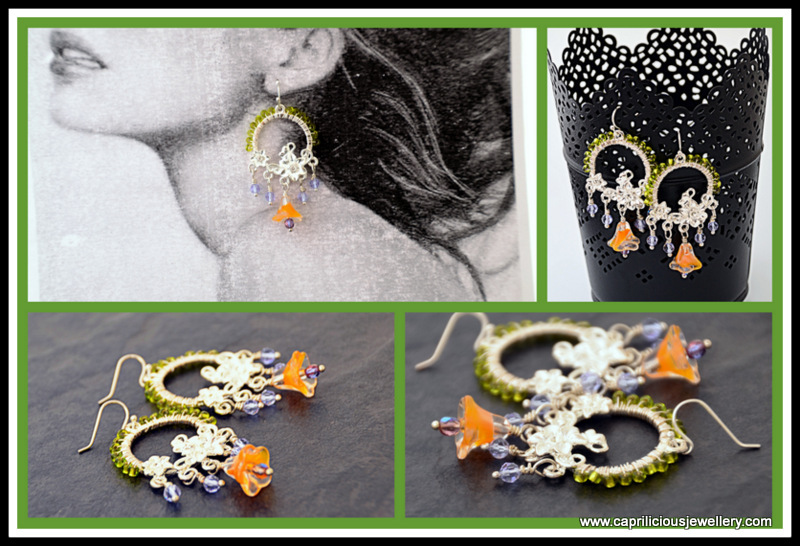 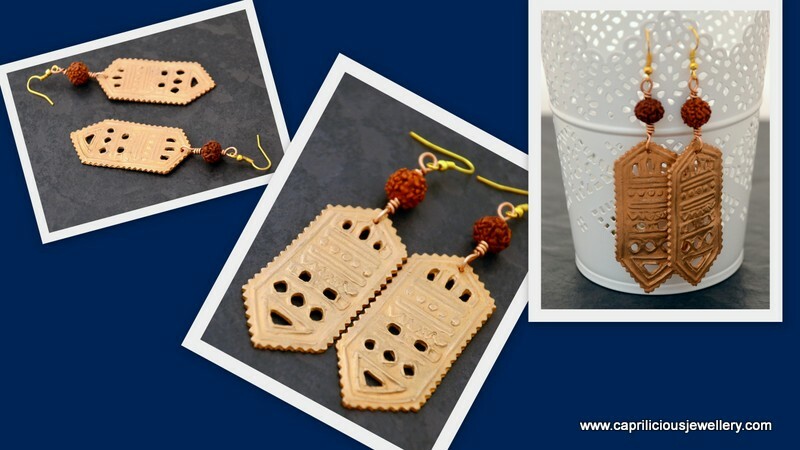 Pretty little earrings, with little lacy squares and a central floral motif. Each one has a Czech glass tear drop dangling from it. 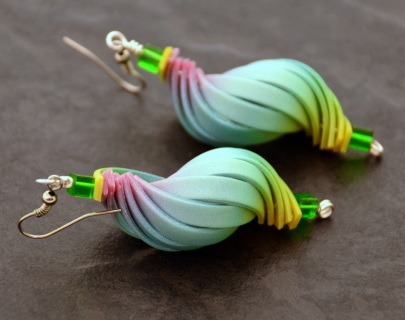 Two pairs available - please state clearly which one you prefer from dark green and pale pink. The pale green andgold earrings are sold and unavailable. 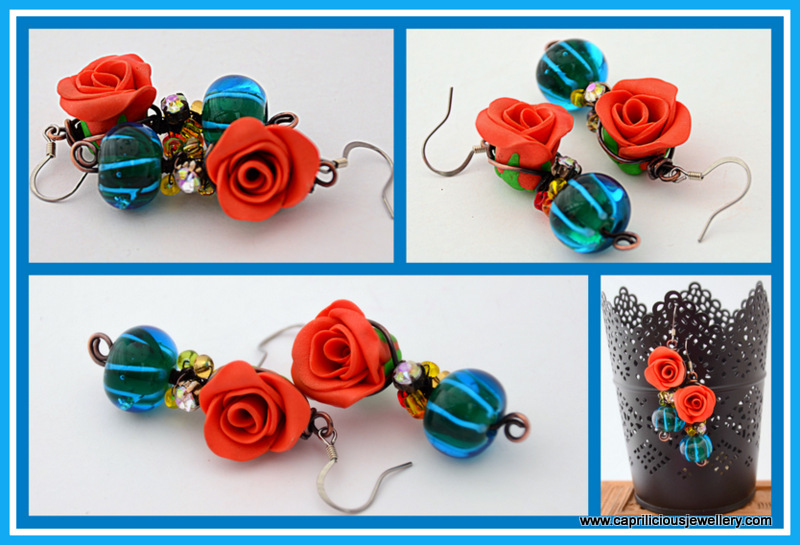 Blue handmade lampwork beads with little orange polymer clay roses and copper wire tornado beads, 2" long, very pretty and different. 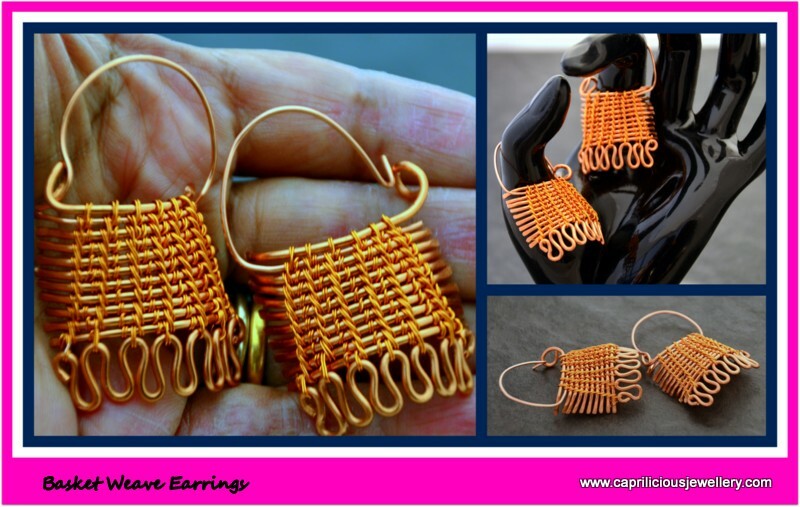 The ear wires are stainless steel. 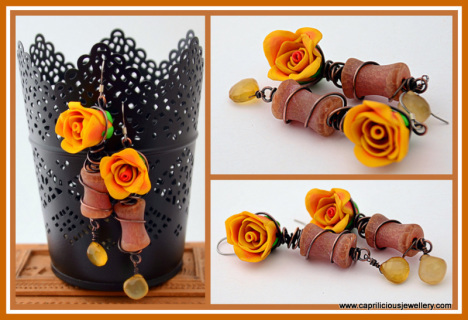 Yellow handmade lampwork beads with little yellow and orange polymer clay roses and copper wire tornado beads, 2" long, very pretty and different. The ear wires are stainless steel. 2.2" long, made of polymer clay, coated with resin, in lilac and pearly white, colourful, light and easy to wear. Please note :- The model is not life size and the earrings look larger than they are on her - this is only meant to show how they hang from the ear lobe and not to imply size. 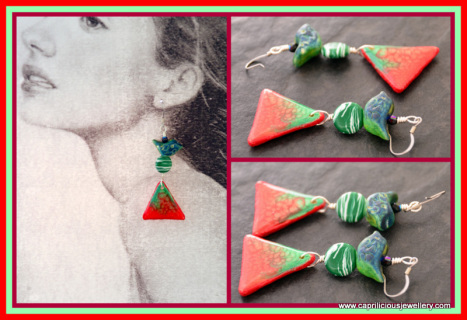 Little triangles of polymer clay with paint effects, covered by a layer of resin. held by a green and white bead and a little green birdie. 2.9" long and very different from the usual. 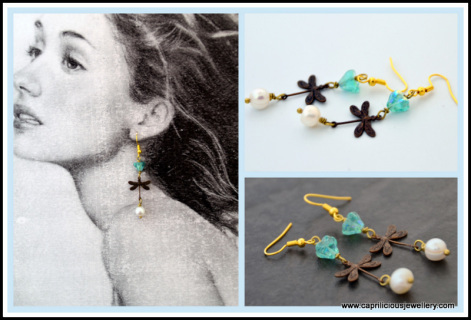 Teal green and gold polymer clay charms with paint efects protected by a layer of resin on shimmery shell pearls and little Czech glass blue flowers. 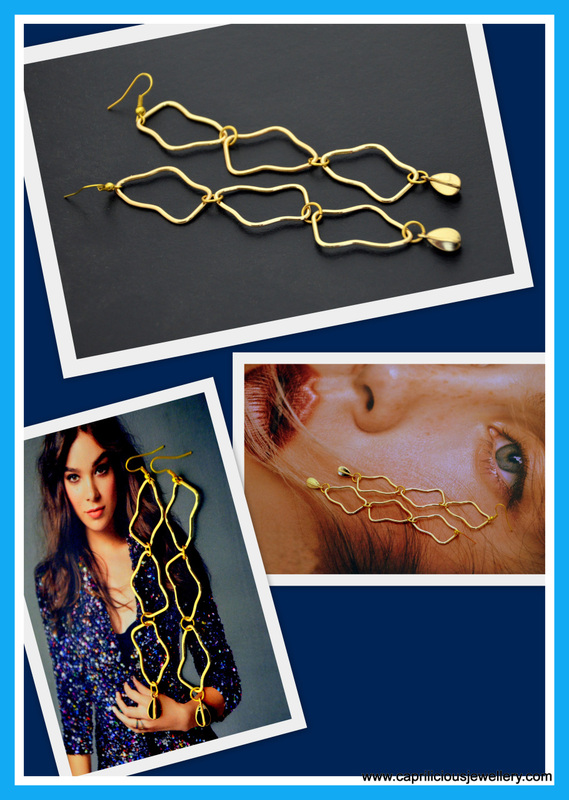 2.8" long, light and easy to wear. 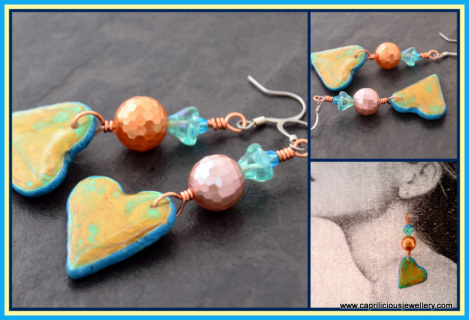 Little silvery grey and pearl paint effects on polymer clay, protected by a layer of resin on handmade orange ceramic hearts. 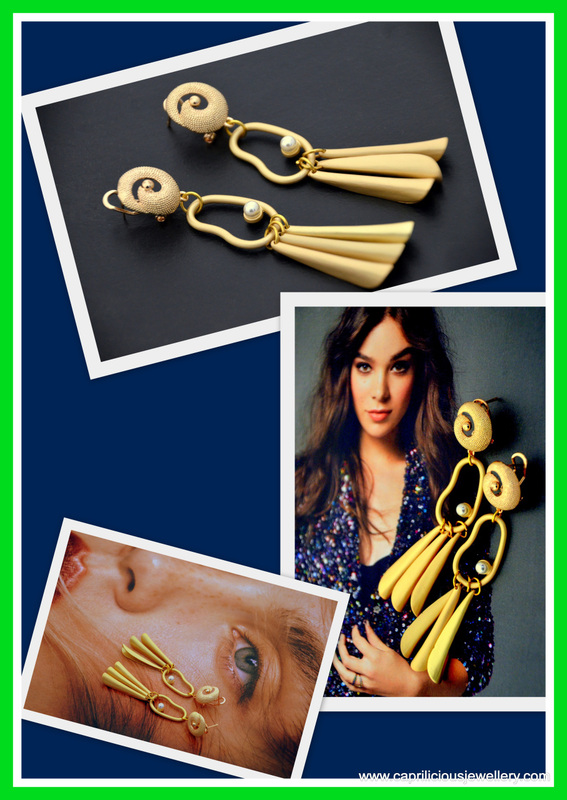 2.8" long, striking, whimsical and are bound to be favourites in your collection. 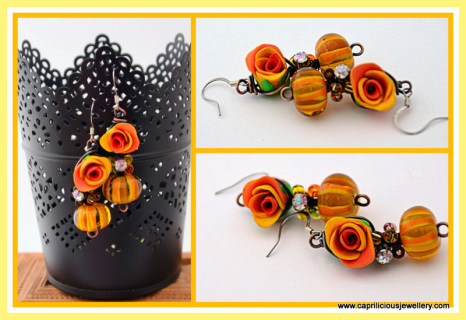 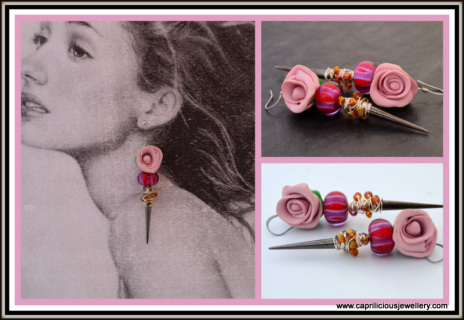 Slices of a polymer clay floral cane, one round and the other rectangular and wirework and glass bead circles make up these unusual and contemporary earrings. They are 2.6" long, light and will make a whimsical addition to your go-to jewellery collection. 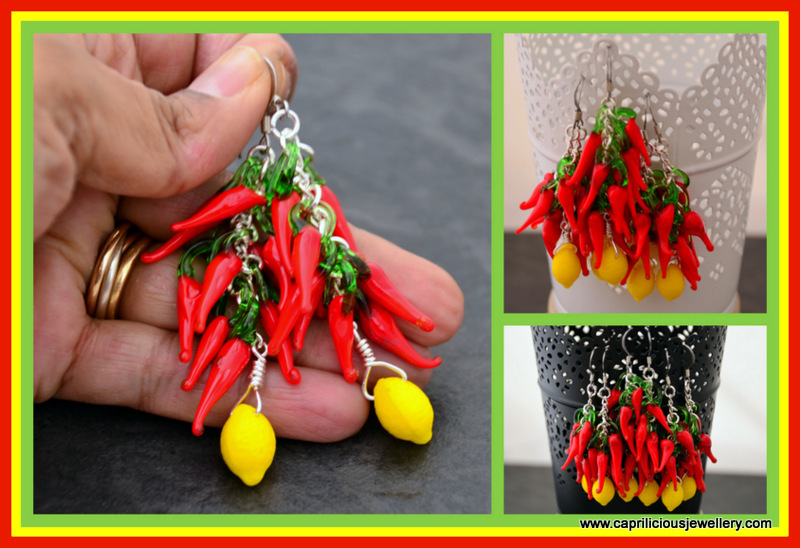 Handmade glass chillis made in the UK and little handmade glass lemons I sourced from Latvia dangle from a chain in these pretty and light earrings. 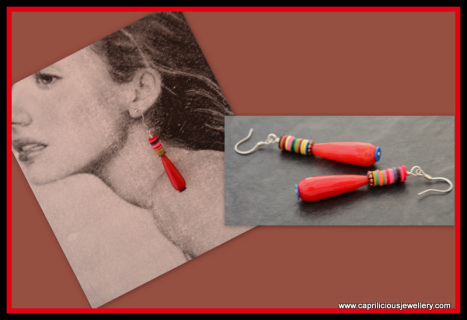 2.8" long they are great fun to wear. Stainless steel ear wires. 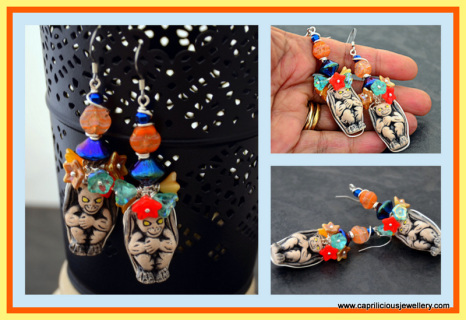 Ceramic ghouls from Peru, handmade, and one of a kind with beautiful yellow eyes, with a Kahloesque headdress of Czech glass flowers, Czech firepolished beads and flowers in a 3" long pair of spooktacular earrings. 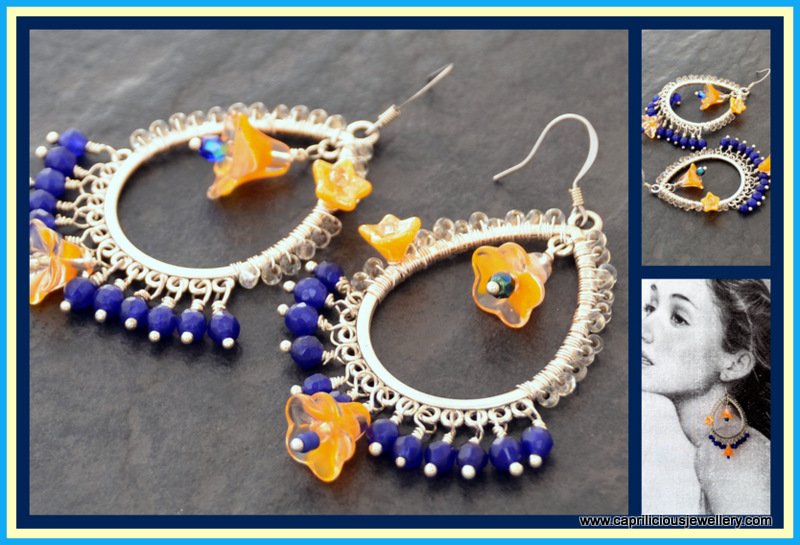 A very pretty ghoul, and one of a kind fun earrings! 2.4" long earrings made of little polymer clay butterfly cane slices, covered with a layer of resin. A ​matte white crackle agate bead and diamante studded square spacers enhance these pretty one of a kind earrings. 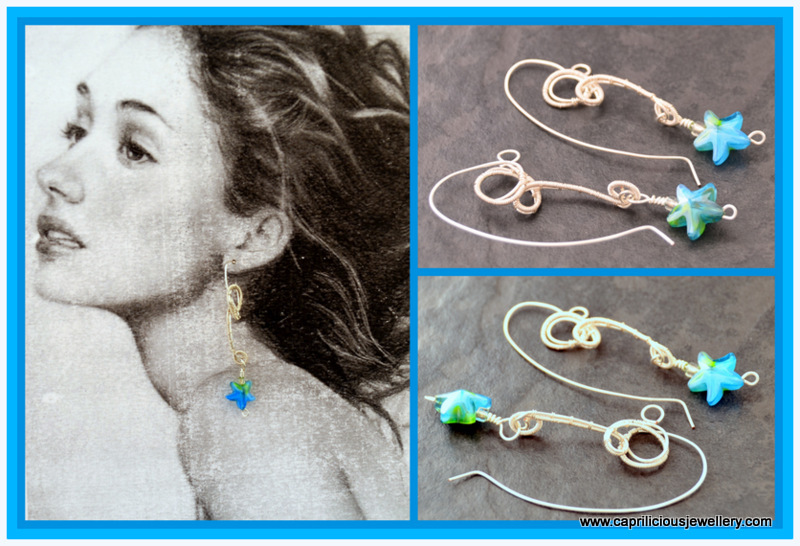 The earrings are 2.6" long with two long trailing strings of diamante, approximately 3" long. 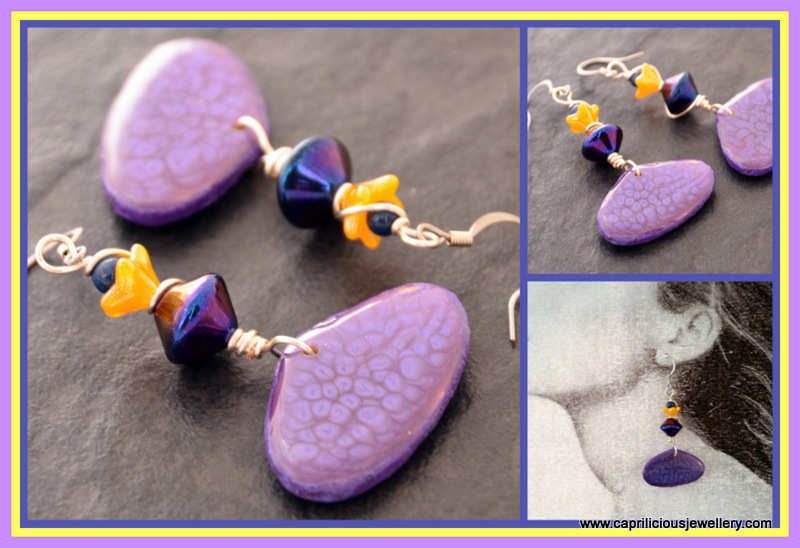 A resin covered polymer clay butterfly wing held by a steel grey handcarved fluorite flower, light and easy to wear, very different and one of a kind. 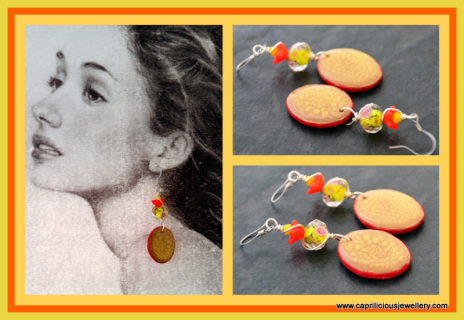 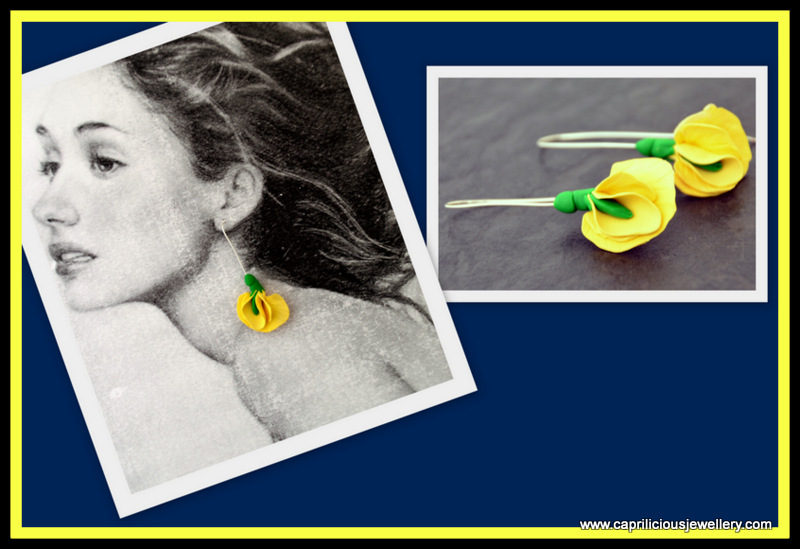 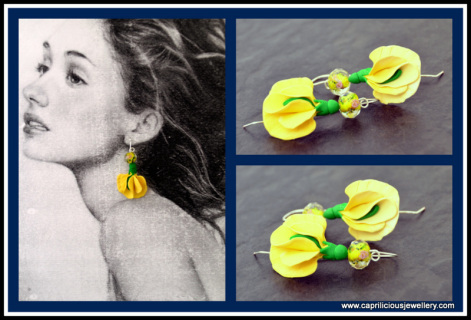 These sweet sweetpea earrings are from a tutorial I published in Bead and Jewellery magazine, they are 2.4" long, light and easy to wear with a yellow lamp work bead adding interest - bring summer to your ears! 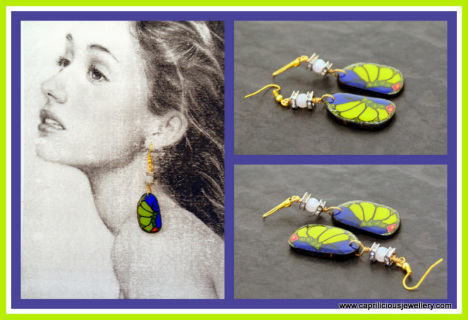 The woman in the drawing is not life size! 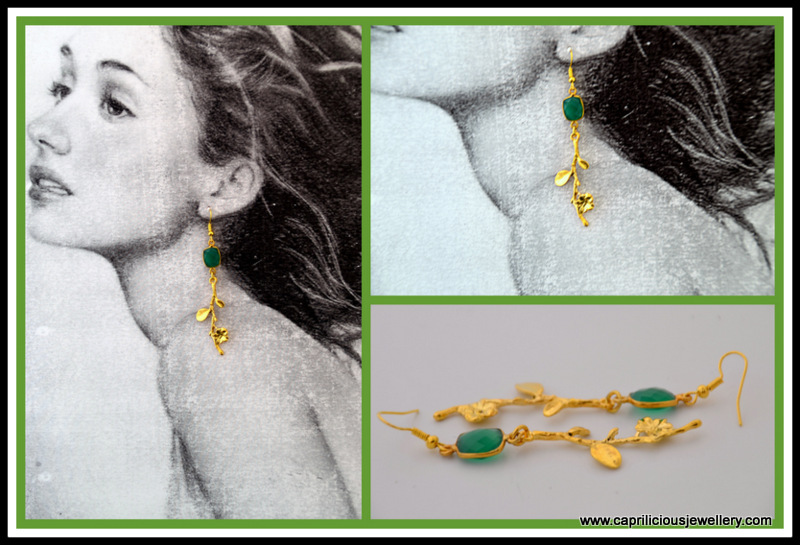 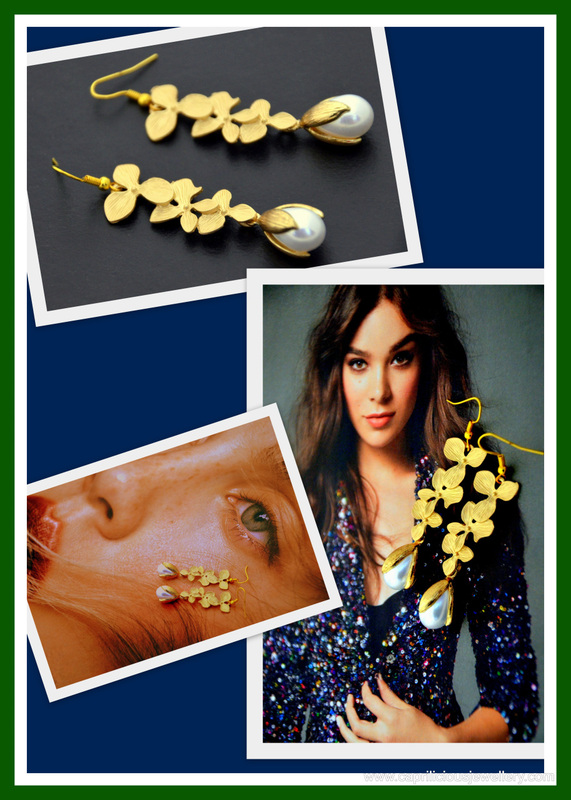 Dark emerald green semi precious gemstone candy bead and flower earrings, 3" long, light and sophisticated, easy to wear - gold plated branches. These sweet sweetpea earrings are from a tutorial I published in Bead and Jewellery magazine, they are 2.7" long, light and easy to wear - bring summer to your ears! 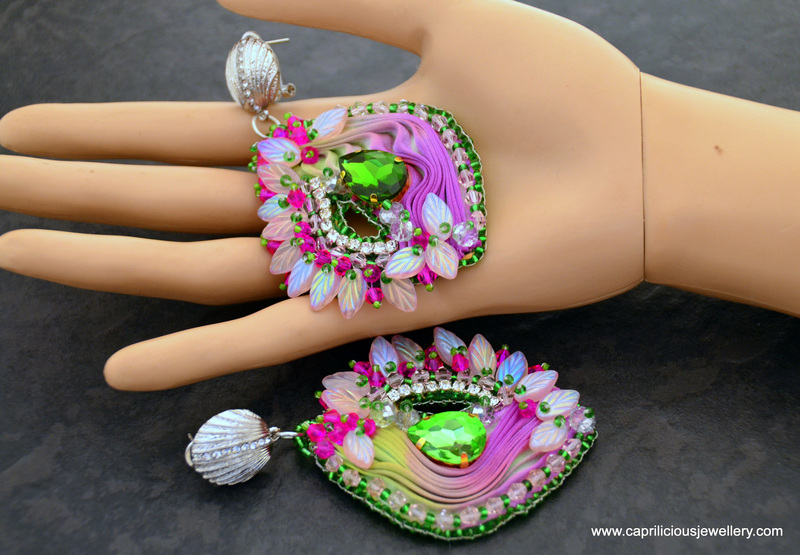 Very light, 2.8" long colour treated shell surrounded by soutache embroidery and silver coloured glass beads, and freshwater pearls . 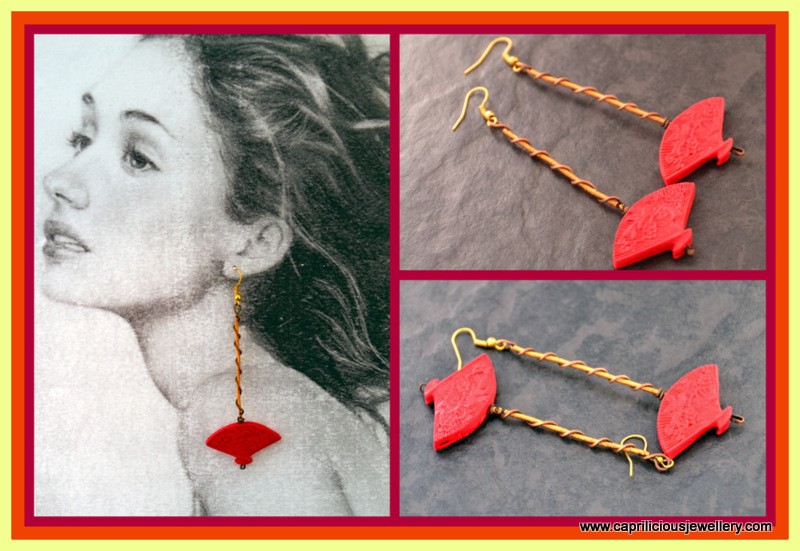 The woman in the picture is not life size but meant to show how the earrings will hang when worn. 3" long, red cinnabar squares on copper squiggles that have been antiqued on gold tone ear wires. Very showy, but light, 3" long chandeliers, with dangles of faceted lapis lazuli and orange Czech glass flowers, The arms of the chandeliers have been embellished with seed beads and glass flowers. 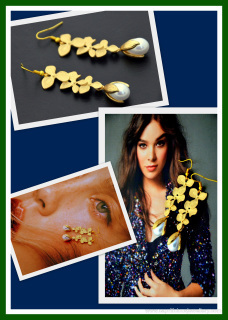 Wear this of an evening and watch the compliments roll in. If you like long earrings but are anxious about their weight, look no further - these shoulder dusters are light and easy to wear, but look substantial. 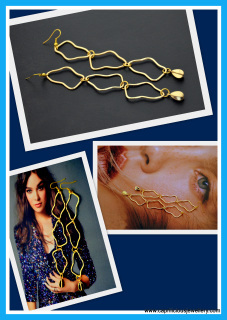 The lever back earwires are sterling silver and therefore hypoallergenic - Enjoy!! 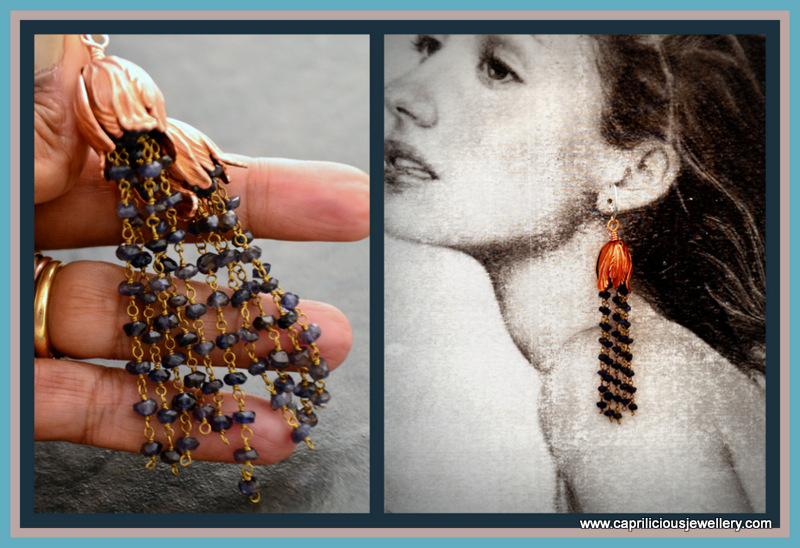 3.5" long beaded tassel earrings -with dark blue iolite. Bronze bead caps imported from the USA and sterling silver leverback ear wires. 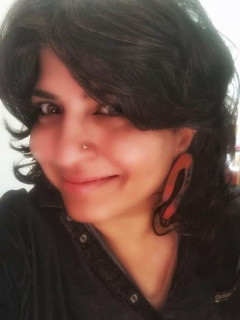 The woman in the picture is not lifesize and meant to show how the earrings would hang. 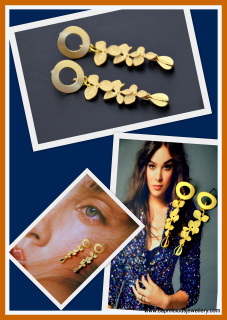 These earrings are light, showy and easy to wear so you can enjoy your parties without a strain on your earlobes. 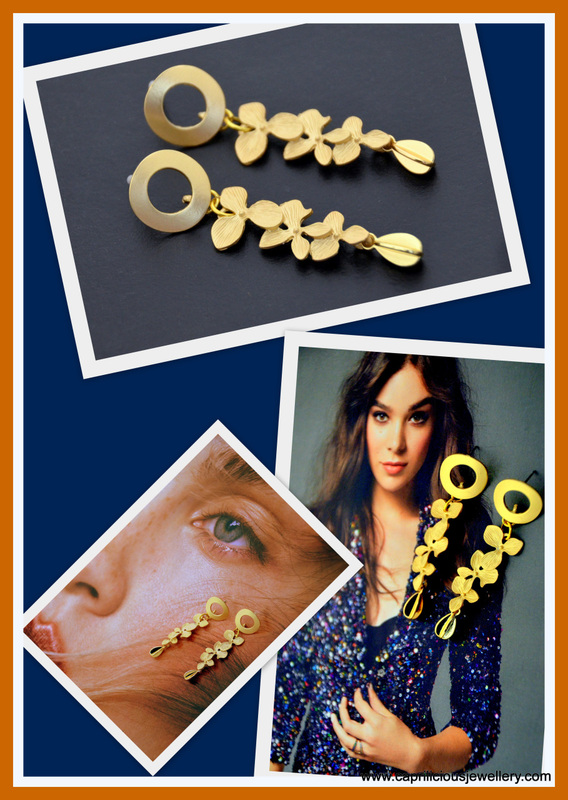 If you need a stud rather than an earwire, please message me and I can arrange this for you. 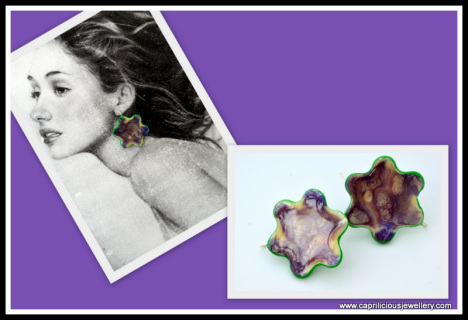 2.2" long tripleorchid earrings with a stud finding, surgical steel posts, Coffee bean shaped dangle. 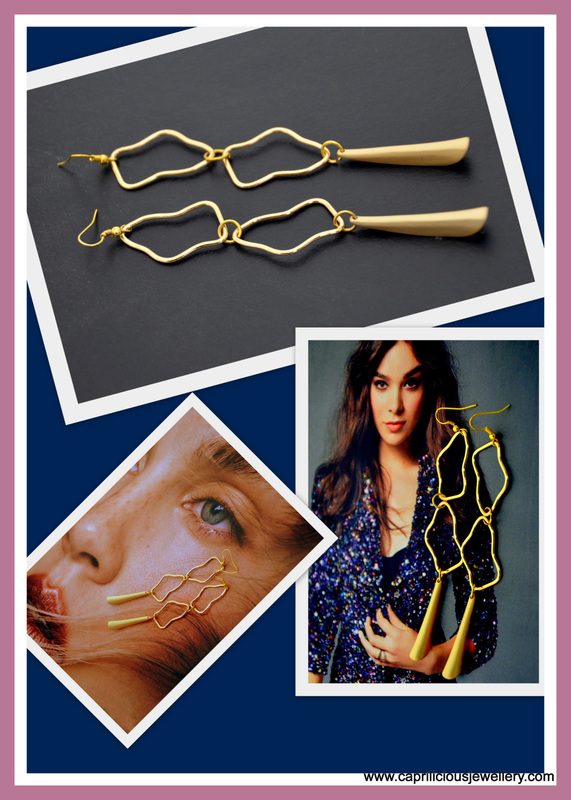 4.5" long, shoulder dusters, asymmetrical shapes linked together with a long matte gold tone dangle on gold tone ear wires. 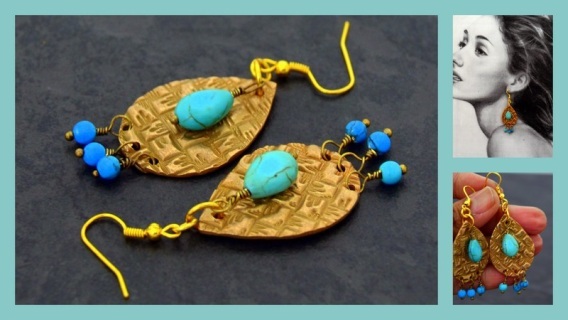 5" long, shoulder dusters, feather light asymmetrical shapes linked together with a coffee bean dangle on gold tone ear wires. 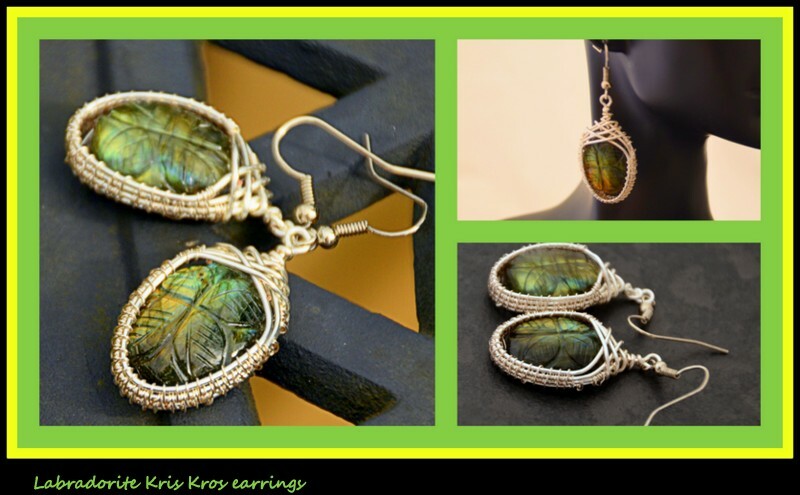 The ear wires can easily be changed out to silver or a stud finding on request. Inverted U shaped earrings, one arm shorter than the other, carrying a pearl and a coffee bean on each.3" long on goldtone ear wires that can be swapped out to silver or stud findings on request. Asymmetrical,mismatched.colourful, large, visible - all the things I love. About 3" long, a horseshoe in one ear and a stylised droplet in the other, both with hypoallergenic stainless steel stud findings to provide additional support, although the earrings are very light and easy to wear. 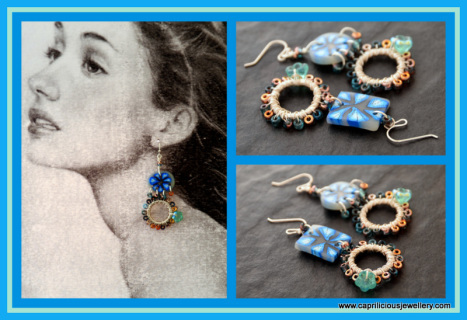 Put your hair up, put these earrings in and hey! 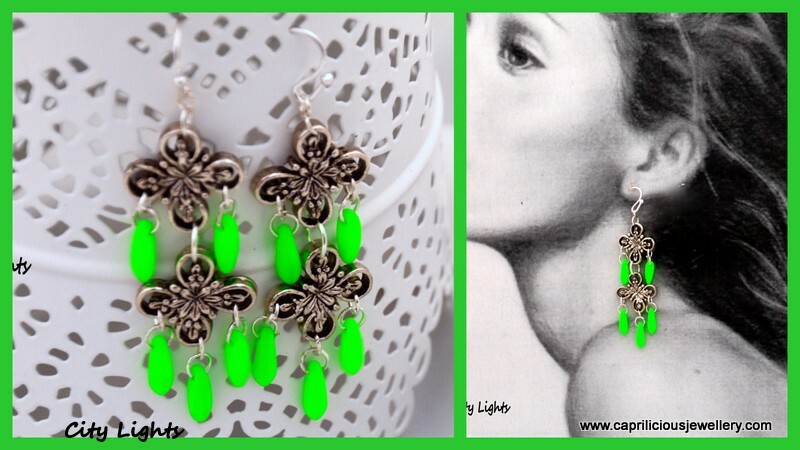 presto, instant hi visibility!! 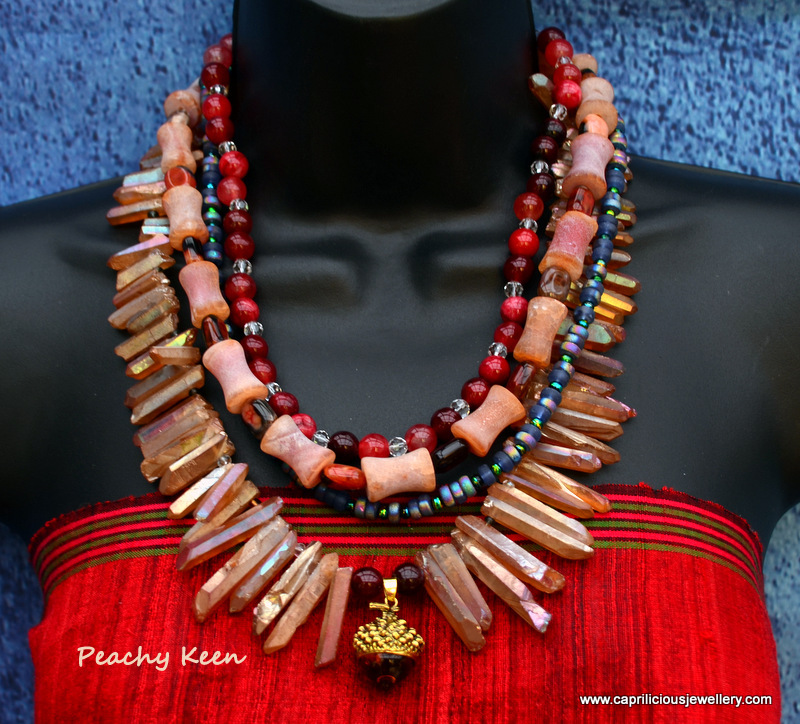 Available in pink, maroon, blue, faux bone tribal and denim blue - try more than one of them, I'm sure you will love them. 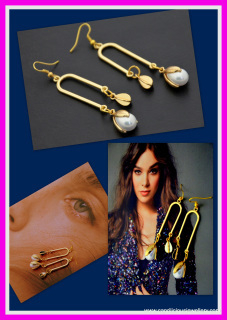 Please mention the ones you want clearly at checkout. For people who might not be into asymmetrical! About 3" long, shiny black horseshoes, a pearl dangling from each one,with stainless steel hypoallergenicstud findings to provide additional support, although the earrings are very light and easy to wear.